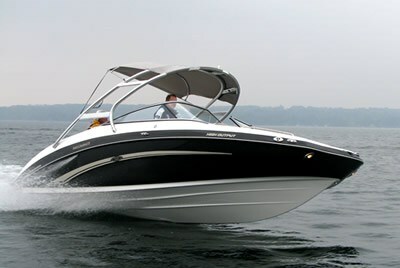 The 242 Limited Series High Output is completely new from Yamaha Sport Boats for the 2010 model year. After surveying owners of previous 230 and 232 models, most of their suggestions for new features and technologies were incorporated into the new 24' platform. Starting with the black hull and special graphics, above the waterline the height of the freeboard has been increased significantly. Adding to this new profile is the forward facing, dual-rail aluminum tower complete with cockpit lighting and 2 speakers. Stepping aboard the bow, several features are apparent. A forward dual-purpose anchor locker exposes a unique folding boarding ladder for easy entry/exit into the water from this end of the boat. The seating area is longer and wider than previous models and readily seats six. Multi-function filler cushions and backrests can be placed to allow a myriad of seating and lounging positions, even for the tallest passengers. Removal of the forward sections results in forward-facing "Rumble Seats" right at the bow. Upholstery is premium grade and handrails and cup holders are stainless. A huge storage locker is located centre-line in the non-skid floor under snap-in carpet. Bow docking lights do not look like a glued-on afterthought. Moving aft through the centre-opening windshield you'll find another new feature: an enlarged, carpeted head compartment. It does not come with a toilet because the owner survey suggested many did not want or require one, but if preferred, dealer installation is not difficult. The LS has a great captain's chair with movable bolster, if you want to stand. Portside is another captain's chair and aft of that, a lounge seat that allows the passenger to face fore or aft as a ski spotter. There's loads of storage below and a removable cooler is located under the starboard-side cushion. A removable table with angled post and side receiver mounts off-centre to allow passengers to exit onto the swim platform with the table in place. All of this flat space is possible because of the low centre of gravity mounting position of the engines and jet drives. Not only are these power systems lower, the pair weigh less than a single sterndrive of similar power. A Bimini is standard equipment. There are a total of 15-cup holders throughout. Step through the centre opening and you're on an enlarged two tier, cushioned, stern lounge and swim platform so low to the water that you could almost swim right onto it! The jet drives also permit this low platform and there are inspection covers in the platform to allow easy removal of anything that might obstruct the jet pump. For safety the engines will not run with these covers open. The table also has a mounting bracket back here to allow snacking while lounging. Docking cleats are pull-up and recessed when not in use, so there's nothing here to get snagged on. Enough gazing at the eye candy, and on to the water test. The helm is very comfortable with all controls easily accessed. The instrument panel, quite simple in design and appearance, with analog gauges and integrated displays, delivers amazing performance. GPS based, you have instant access to engine RPM and vessel speed, fuel level, fuel used, gallons per hour, and miles per gallon fuel flow data. Battery voltage, latitude, longitude, elevation, compass heading, water depth and temperature, trip odometer, clock, and engine hours are all available at a touch. The stereo allows an iPod to plug right in and a floating, full-function remote control works within a 50-foot radius. There are a total of eight speakers on this model including two on the swim platform and two in the tower. The helm has a Cruise Assist button with a + on top and - on the bottom; more about this shortly. As with all fuel-injected engines, starts are instant. New for 2010, the exhaust system includes resonators to quiet the sound. The dual throttles are fly-by-wire, so controlling them requires no effort. At low speed, touch the Cruise Assist button and the engine runs at no-wake speed. Touch the plus (+) button once and the speed moves from 4 to 5 MPH; touch it again, it goes to 6MPH. The minus (-) side of the Cruise Assist reverses the procedure. 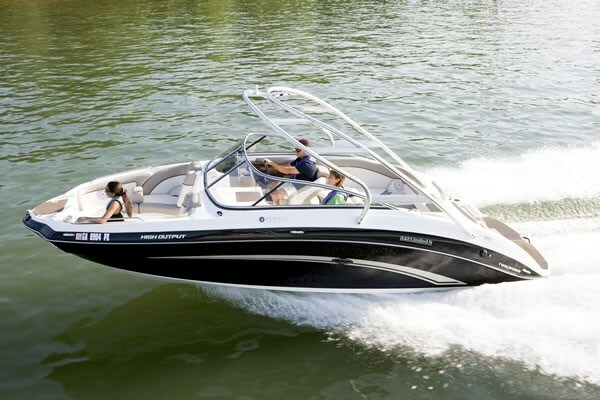 This feature makes "no wake", or "reduced speed zone" cruising effortless. Acceleration is outstanding for 180 HP X 2! Time to planing speed with three adults aboard and a full tank of fuel was under 3 seconds! 4200-RPM results in a 24 MPH cruise for a lot of easy ground covered in a day's cruise. Hit the Cruise Assist again and the speed is set. Just like the cruise control in your car, each touch of the (+) side increases the speed by 125 RPM, or drops the same with each touch of the (-) side. For effortless cruising, skiing or wakeboarding, this is a great feature. Top speed is just above 50 MPH. If you've never driven a jet boat at speed, you're in for a treat in turning and maneuverability. A TV crew wanted some action shots, and with a Yamaha professional at the helm, they got some action. It was hard to believe how this boat handled, and although I wouldn't recommend everyone try what we did, it sure does perform, turn, stop, and whatever else you want. For those used to twin engine direct drive or sterndrive boats, docking does require some getting used to, but once you get the hang of it, there's no problem; it's just different from what you may be familiar with. The drive system also allows for operation in much more shallower water than most other drive types. For a 24-foot bowrider that seats 10, this boat delivers comfort, performance, economy, a host of electronics and other features. Included in the price is a painted tandem trailer with Canada - legal brakes, spare tire, and LED taillights. I'd put it on my short list!